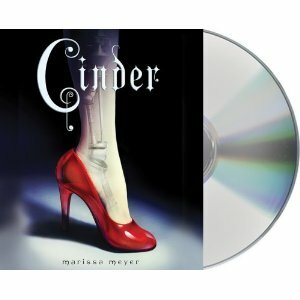 I'm pleased to host a giveaway today of the audiobook of Cinder by Marissa Meyer. This cyberpunk/scifi retelling of Cinderella has a lot going for it (you can read my review here). The book and audiobook are due out January 1st. But Macmillan Audio is letting us in on a sneak peek of the audio version below. If you like what you hear, please leave a comment with your favorite fairy tale and your contact information, and you'll be entered to win the audiobook! This giveaway is open to U.S. addresses only and will end at midnight on December 9th. My favorite fairy tale is probably The Twelve Dancing Princesses. Not sure if that's an official fairy tale, actually! Awesome giveaway! One of my favorite fairy tales is Sleeping Beauty, I've read so many interesting variation of it. I love the story of Tam Lin, and who no matter what love can hold on. I am so totally excited for Cinder. This looks like a freaking awesome adaptation of a classic. I really do love Cinderella the most. I am forever a Little Mermaid fan. Twelve Dancing Princesses of The Seven Swan Brothers. My favorite fairy tale has always been sleeping beauty! Thanks for the awesome giveaway!! My favorite fairy tale is the Twelve Dancing Princesses! My favorite fairy tale is puss in boots. I'm partial to "Molly Whuppie." It's a Jack-the-Giant-Killer story with a girl as the protagonist. I've always liked trickster stories, and since this one has a girl outsmarting the giant, I'm just happy. My email is nan.welter at gmail dot com. I always liked Hansel and Gretel. I love fairy tale retellings -- tt's so hard to pick one favorite! I'd have to go with Cinderella, however, it's a classic! I teach kindergarten and we read the original Grimms ~ I'd have to say I like Snow White the best! Ooh I would love to win! my favorite fairy tale is Beauty and the Beast. My favorite fairytale growing up was Beauty and the Beast because of a retelling I read that I fell in love with. Unfortunately, I have not been able to find it and I can't remember the title. Now, ever since I heard it read by David Tennant The Steadfast Tin Soldier has been my favorite. His accent makes ALL the difference! Spindle's End by Robin McKinley. Its an amazing book. I am a huge fairytale fan, but my favorite has to be Snow White. I was excited about the giveaway and now that I see it is on audio... even more excited!!! Favorite huh? I do like Cinderella.... and Beauty and The Beast. Team Belle! I loved Beauty and the Beast ever since I was a kid. I just love fairy tales. I loved reading Hans Christian Anderson and the Grimm brothers' stories. One that I always loved reading was that of Snow-White and Rose Red. This would be so awesome! I loved fairy tales as a child and still read many grown up retellings - my favorite is probably Beauty and the Beast, in all of its variations. Thanks for the chance to win! I really like The Goose Girl by Shannon Hale. Hope that qualifies! I've always liked Little Red Riding Hood and Hansel & Gretel. I liked the spooky ones. Heh. My favorite fairy tale? Either Beauty and the Beast, or The Little Mermaid! Sleeping Beauty has always been my favorite!